On June 8, an estimated 250,000 people attended the Gay Pride Parade in Tel Aviv. Tourists from all around the world came to Israel to watch and participate in the event. The theme of this year’s event is “The Community Makes History” — a reference to the LGBT community in Israel. Meanwhile, as the Israelis were celebrating tolerance on the streets of Tel Aviv, their Palestinian neighbors were busy doing precisely the opposite: they were demanding that people should be fired for producing a television comedy about gay people in the Gaza Strip. In Palestinian and Arab society, homosexuality is denounced and stigmatized. Homosexuality is illegal under Hamas rule in the Gaza Strip, and dozens of gay Palestinians have fled to Israel out of fear of persecution and harassment. In the West Bank, the laws of the Palestinian Authority also do not protect the rights of gay Palestinians. In the past decades, several gay Palestinians have been killed in both the West Bank and Gaza Strip. In 2016, Hamas executed one of its top military commanders, Mahmoud Ishtiwi, 34, after he was found guilty of “moral turpitude” — a thinly veiled reference to homosexuality. Ishtiwi, who was killed by three bullets to the chest, would have lived a safe life had he been an Israeli citizen. If he were living in Israel, he could even have participated in the Gay Pride Parade in Tel Aviv without having to conceal his identity. But he lived in the Gaza Strip among people who consider homosexuality a sin punishable by death — and who act on it. The case of Ishtiwi lays bare a major difference between Israeli and Palestinian society and culture. Israel has been marching forward towards tolerance and acceptance of the gay community’s rights, while Palestinians remain as intolerant as ever with regards to those who dare to act and speak differently. The uproar over the television program about gays in the Gaza Strip is yet another example of how Palestinian society is still far from recognizing and respecting the rights of the gay community. The program, which was filmed recently in the Gaza Strip, features a comic scene in which a male actor makes sexual advances at young men as part of a “candid camera” show. In other words, the sexual advances are not for real and are only meant as a joke; those targeted were not even aware that were being filmed secretly. In the Palestinian world, however, this is no laughing matter. The comedian’s apology, however, has failed to calm his critics, who took to social media to express their disgust over the program. and his demeanor. “What kind of an apology is this after you have offended all religious and cultural values for the sake of fame?” wrote Taghreed Alemoure in a Facebook comment. Several other Facebook users accused the comedian of promoting “sexual abnormality” and used derogatory remarks and curses to condemn him and threaten him. “Removing the video does not exonerate you from this moral crime,” commented Mohamed Al-Aila. Some Palestinians called on Hamas to take action against Shurrab and the producers of the show. Their call did not fall on deaf ears. The Hamas Interior Ministry quickly summoned for interrogation one of the show’s producers, Emad Eid. 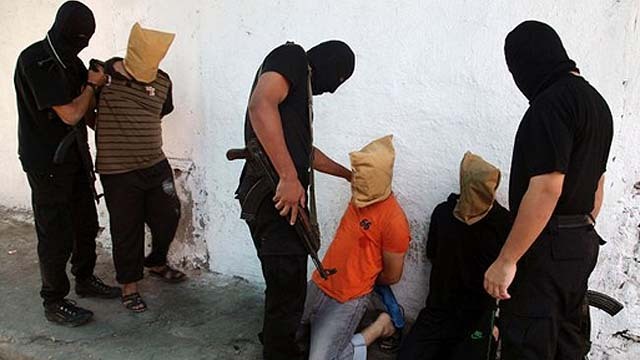 Although Eid was released a few hours later, Hamas says it will continue to investigate the matter. Meanwhile, the Palestinian Authority has launched an investigation of its own into the television show, also deeming it “harmful to our people and their values.” The Ramallah-based Ministry of Information said that it was planning to take legal action against those responsible for the show. What can one learn from the controversy surrounding the Palestinian version of “candid camera?” Basically, that it is safer to be a member of Hamas than to be gay. Palestinian leaders would much rather see young Palestinians trying to kill Israelis than talk about gays in their own society. In the world of Hamas and the Palestinian Authority, there is no room for comedy or satire. How can there be, with no room for gays or anyone who dares to touch on issues that are taboo? It is hardly a secret that Palestinian society has gay members, but their lives are rather different than those of their peers just a few miles away in Israel. How coincidental and symbolic that the Palestinian gay controversy erupted on the very day that tens of thousands of Israelis were celebrating gay pride in Israel.